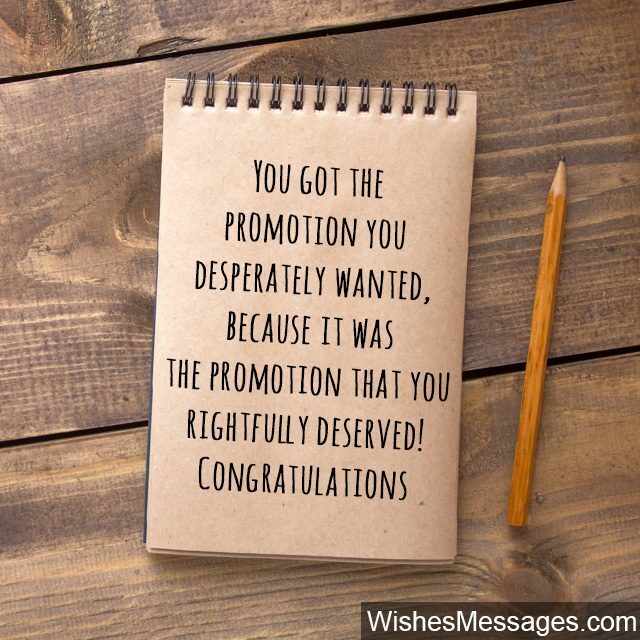 Congratulations for Promotion at Work: Whether it is a colleague, boss, friend, husband or wife – getting a promotion is a big career milestone and your wishes should convey just that. Think of sweet messages and inspirational quotes that suit their jobs and personality. Write your thoughts down on an elegant greeting card or a note. For informal wishes, send a text, tweet it out aloud or wrap it up with a short Facebook post. Don’t be afraid of being cheesy, motivational words can have a deep impact and your encouraging note could inspire people to work harder for the next big step in their jobs and careers. 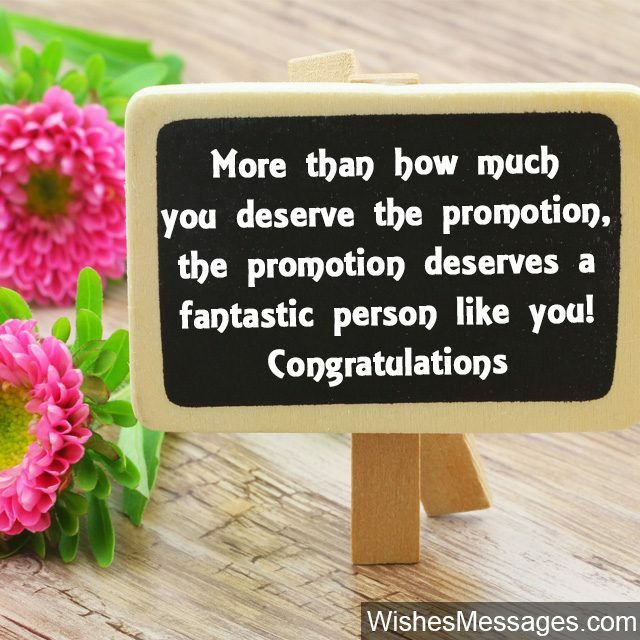 1) More than how much you deserve the promotion, the promotion deserves a fantastic person like you. Congratulations. 2) More responsibilities, tighter deadlines, bigger targets and working back till late – this is what a promotion really means. Sorry to burst your bubble but someone had to do it! Good luck and congratulations. 3) We knew that you were talented and brilliant, much before your boss eventually figured it out. Congratulations. 4) You mastered the art of working hard and squeezing the most out of your time at work. Now you have to master the art of making others do the same. Congratulations on becoming the boss. 5) With your new promotion at work, your pockets will get heavier. But don’t worry because your wife will always be there to lighten them up. Congratulations. 6) You got the promotion you desperately wanted, because it was the promotion that you rightfully deserved. Congratulations. 7) Working overtime and helping colleagues without any personal gain – there are no short term rewards for these things but karma eventually comes back with massive rewards. Your promotion is a classic example. Congratulations. 8) You chased the promotion like a hungry tiger. Now it is time to sit back and relax the fruits of your hard work like a lazy bear. Congratulations. 9) Your promotion has elevated you not only in the eyes of your colleagues and bosses, but also in the hearts of your friends and family. Congratulations. 10) Your skills are unmatched, your knowledge is priceless and your experience is invaluable. You are the employee that can neither be replaced nor replicated. Congratulations for your much deserved promotion. 11) You may have got a promotion at work but don’t forget to spend more time with your wife, else you’ll get a demotion at home. Congratulations. 13) Hard work is like salt. No matter how flavorsome the ingredients, a dish can never be complete without it. Congratulations adding salt to your life and getting a fabulous promotion. 14) Don’t get too excited on being promoted. Consider your raise an increase in your family’s spending limit. 15) Congratulations for successfully juggling the responsibilities of family and work. You are truly an all-rounder and go-getter. 16) I can already predict that there will be many jealous people among your LinkedIn connections. Congratulations for being promoted to an enviable role. 17) I will never make the mistake of saying that you were lucky to get a promotion in your job because I know that you have worked bloody hard for it. Congratulations. 18) Your promotion is just the first word in the first paragraph of the first page in your success story. There is lot more that lies ahead. Congratulations. 19) All this while, I thought that your bosses were visually challenged because they couldn’t see that your promotion is long overdue. Did they get new glasses? Congratulations. 20) Management gurus have always thought that there were only two types of employees – leaders and followers. You have proved them wrong by being a leader when your team needed direction and being a follower when your bosses gave you instructions. Congratulations for getting promoted. 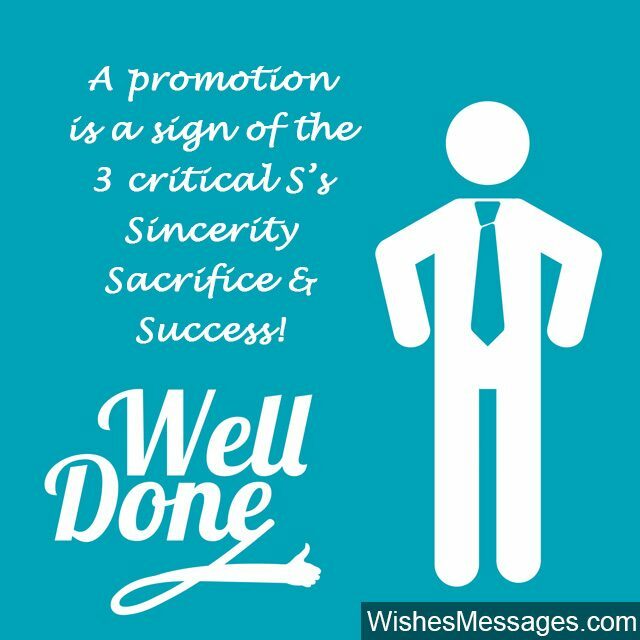 21) A promotion is a sign of the three critical S’s – Sincerity, Sacrifice and Success. Congratulations and well done. 22) Your middle name should be Inspiration because you inspire your colleagues to become better professionals. Congratulations. 23) Your promotion shows that your bosses have good decision making skills because they made the right decision by promoting a great employee like you. Congratulations. 24) Your friends know that you are the best. Your family knows that you are the best. 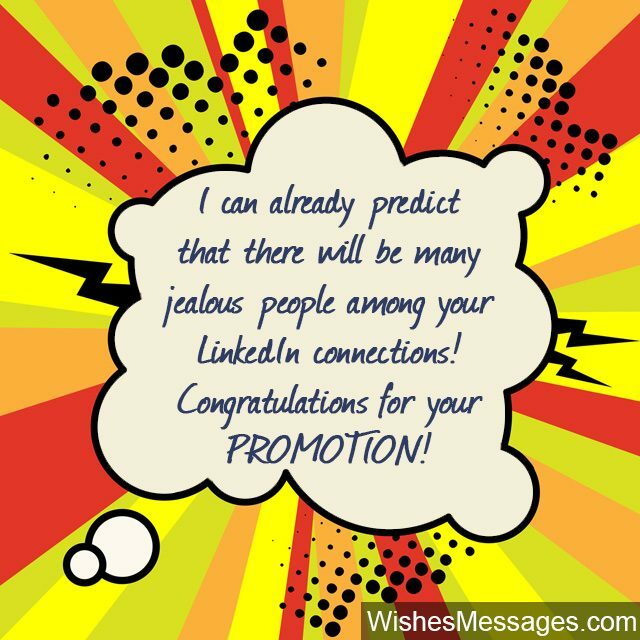 Your promotion proves that now, even your boss knows that you are the best. Congratulations. 25) Are you a Steve Jobs in the making? Are you a Bill Gates in the making? Are you a Warren Buffet in the making? Are you a Mark Zuckerberg in the making? Are you a Larry Page in the making? No one knows yet but since this is just your first promotion, we have lots of time to find out! Congratulations. 26) Promotions will come and they will go. But your hard work will always shine and show. Congratulations. 27) I wasn’t surprised at all, because I always knew that you had it in you to get promoted sooner or later. Congratulations. 28) Your promotion doesn’t come as a surprise to me. Hardworking, reliable, efficient, organized, proactive and effective people usually always get promotions in life. Congratulations. 29) Your promotion has exposed the gritty, passionate and zealous winner who has been sitting inside you all this while. Congratulations, may you always find all the success you’re after. 30) The promotion of an employee like you has reaffirmed my faith in traditional values of perseverance, hard work, dedication and determination. It has also reaffirmed my hate towards malpractices including flattery, office politics and sabotage. Congratulations. 31) Congratulations! 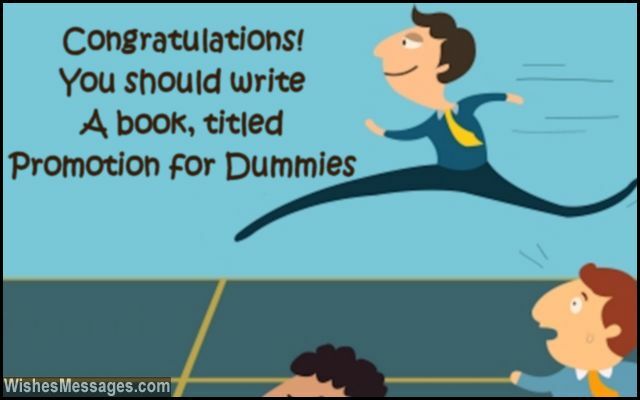 You should write a book, titled Promotion for Dummies. 32) Now we all know why you kept praising your bosses and treated them to coffee and beer every now and then. Jokes aside, congratulations for a well-deserved promotion. 33) Your promotion is just another rung in the ladder of success, just another feather in your cap and just another flying color with which you have succeeded. Congratulations. 34) Your promotion has made you a responsible manager, but your progress in life has made you a responsible human being. Congratulations. 35) I am not Neil Armstrong but I feel like twisting one of his quotes to tell you – May your first tiny step towards professional success eventually become a giant leap in your career. Congratulations on your promotion. 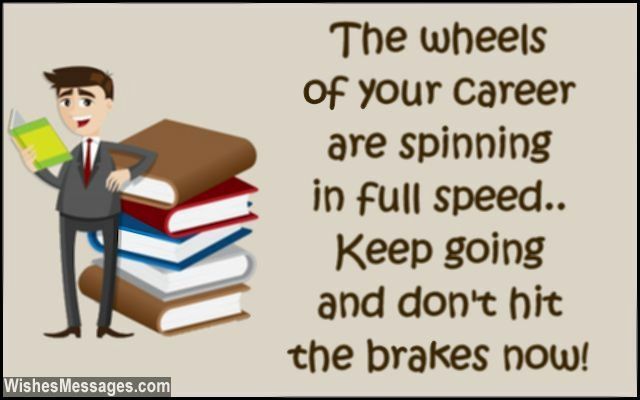 36) The wheels of your career are spinning in full speed. Keep going and don’t hit the brakes now. Congratulations. 37) The reason behind your PROMOTION is spelled out as Persistence, Resilience, Obedience, Motivation, Outstanding, Terrific, Impressive, Optimism and being Nifty at work. Congratulations. 38) You have always been the most beautiful wife to your husband, caring mother to your kids and loving daughter to your parents. Today you have proved that you are also the best professional in our team. I love you, congratulations on your promotion. 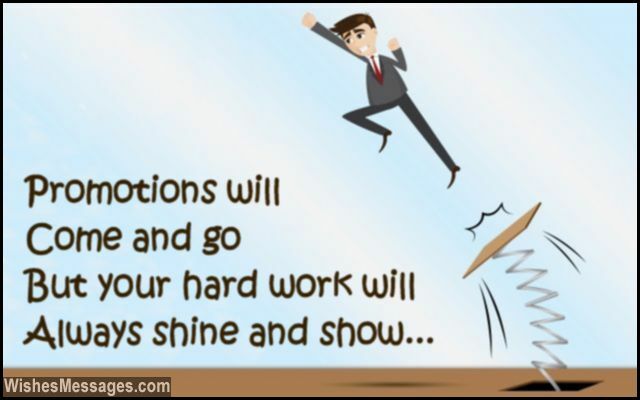 39) Your bosses may have promoted you but don’t feel obliged because it is nothing other than your own skills and sheer hard work that have propelled you to the next level. Congratulations. 40) The hard work that you did through all these months has resulted into a promotion today. Keep going so that you can reap better rewards in the days to come. Congratulations.